Humans have applied it – and very successfully – for plants and animals since antiquity. There is nothing “wrong” conceptually with eugenics for the selective breeding of humans. But the Nazis – and not only the Nazis – brought all of eugenics into disrepute by the manner in which they tried to apply the concept. Because of the Nazis and the coercive treatment of some minorities in Europe and of the Aborigines in Australia where forced sterilisation, forced abortions, genocide, euthanasia and mass murder were used to try and control the traits of future generations, eugenics has come to be inextricably associated with the methods used. Even in more recent times genocide, mass rapes and mass murder have been evident even if not openly for the purpose of controlling the genetic characteristics of the survivors. I note that evolution by “natural selection” does not intentionally select for any particular traits. Surviving traits are due to the deselection of individuals who have not the wherewithal to survive until reproduction. Natural Selection in that sense is not pro-active and evolution is merely the result of changing environments which causes individuals of a species who cannot cope with the change to perish. Evolution has no direction of its own and is just the result of who survives an environmental change. It is not not some great force which “selects” or leads a species into a desired future. Species fail when the available spread of traits and characteristics among the existing individuals of that species is not sufficient to generate some individuals who can survive the environmental change. Natural Selection is therefore not an intentional selection process but represents the survivors of change. Of course, not all traits have a direct influence on survival. All “collateral” traits are carried along – coincidentally and unintentionally – with those traits which do actually help survival in any particular environment. But as conditions change what was once a collateral trait may become one which assists in survival. I have posted earlier regarding the population decline that is inevitable if the fertility rates around the world continue to decline as they are doing. The declining fertility combined with the increase in longevity and the problems of aging pose new challenges of maintaining the growth and maintenance of the infrastructure that we would have become used to. In a hundred years from now the challenge could be a real shortage of labour. The challenge in 2100 will be to maintain the balance between those “producing” to those “supported” in a declining and aging population. Perhaps immigration or population migrations or productivity increases by the use of robots and an increase in the age one joins the “supported” population will be parts of the solution. I have no doubt that solutions will be found, but the “overpopulation problem” would have left the stage. …. 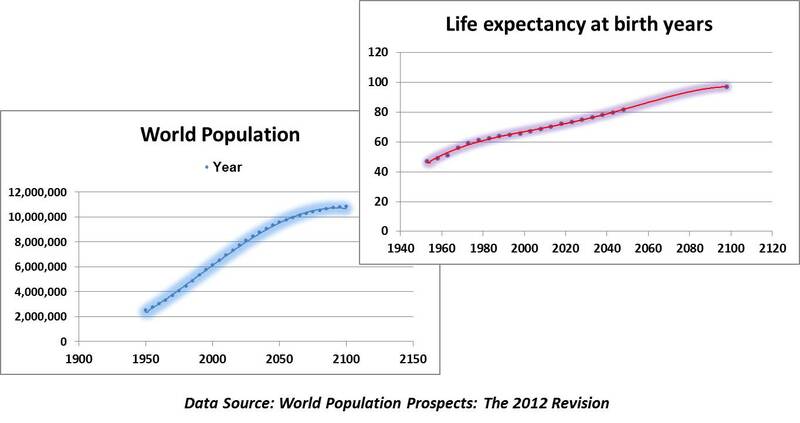 The majority of children being born today in the developed world will live to be over 100 years old. 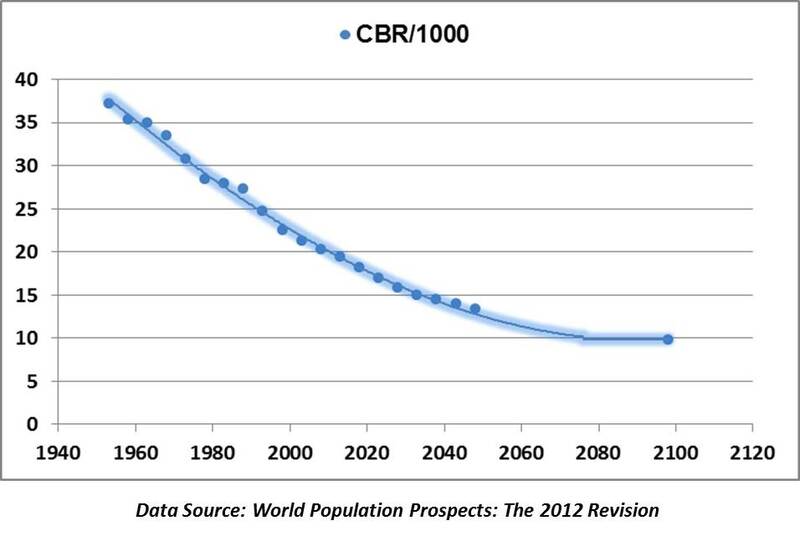 Now as Science 2.0 reports another model simulation shows that The Looming Population Implosion is inevitable and just a mathematical consequence of falling fertility rates. A model based on global population data spanning the years from 1900 to 2010 has caused a research team to predict the opposite of what Doomsday Prophets of the 1960s and beyond insisted would happen – the number of people on Earth will stabilize around the middle of the century and perhaps even start to decline. The results coincide with the United Nation’s downward estimates, which claim that by 2100 Earth’s population will be 6.2 billion, if low fertility and birth rate continues on its current path, below the 7 billion we are at now. The numerical model developed by a team from the Autonomous University of Madrid (UAM) and the CEU-San Pablo University seems to confirm the lower estimate, in addition to a standstill and even a slight drop in the number of people on Earth by the mid-21st century. 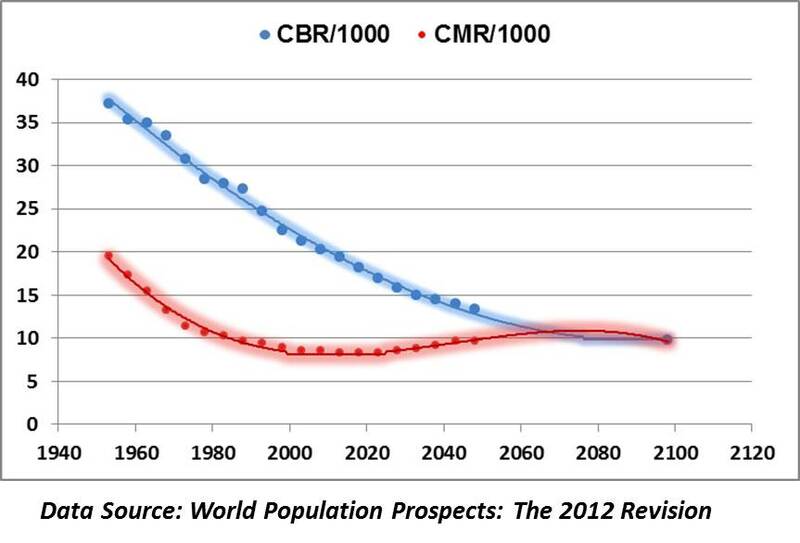 The population prospects between 1950 and 2100 provided by the UN were used to conduct the analysis published in the journal Simulation. ……. The team considered the Earth as a closed and finite system where the migration of people within the system has no impact and where the fundamental principle of the conservation of mass –biomass in this case– and energy is fulfilled. “Within this general principle, the variables that limit the upper and lower zone of the system’s two levels are the birth and mortality rates,” Muñoz pointed out and recalled the change that occurred in the ratio between the two variables throughout the last century. “We started with a general situation where both the birth rate and mortality rate were high, with slow growth favouring the former,” he added, “but the mortality rate fell sharply in the second half of the 20th century as a result of advances in healthcare and increased life expectancy and it seemed that the population would grow a lot.